CONGRATS (USA) (Bay 2000-Stud U.S.A. 2007, Aust. 2011). 7 wins-1 at 2, Santa Anita San Pasqual H., Gr.2. Sire of 584 rnrs, 385 wnrs, 24 SW, inc. Turbulent Descent (Hollywood Starlet S., Gr.1), Emma's Encore, Wickedly Perfect, Forever Darling, Venus Valentine, Polar River, Jacaranda, Cash Back, etc. His oldest Aust.-bred progeny are 3YOs and inc SP Chimboraa, Commiserate and of Jupiter Gold, Sky Heart, Dark Ensign, Forty Four Red, Royal Applause, Sir Charleston, Wide Acclaim, Bakslap, etc. Chimboraa (c. by Congrats). Placed at 2, A$151,350, in 2015-16, 2d ATC Champagne S., Gr.1, Pago Pago S., Gr.2. Excel Oneself (g. by Exceed and Excel). 4 wins at 1000m, 1200m, HK$3,576,440, to 2015-16, HKJC Deauville Yearling Sales H., Peridot H., Deep Water Bay H., Blue Pool H., 2d HKJC Ewo Challenge Trophy H., Arbuthnot H., Longines international Jockey Championship H., Hong Kong Club Challenge Cup, 3d HKJC Man Cheung H., Owl H., Derby Restaurant & Bar H.
Daruna (g. by Dalakhani). 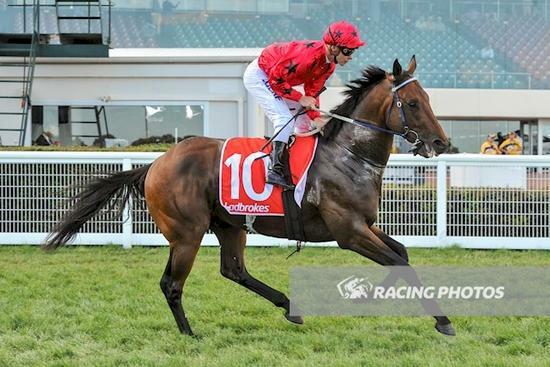 4 wins from 1400m to 1800m to 2014-15, 3d ATC Liverpool City Champion 2YO H.
SHAKE OFF (A.P. Indy). 3 wins-1 at 2-at 1m, 8½f, Del Mar Barona Cup H., L, 3d Hollywood Flawlessly S., L, 4th Santa Anita Harold C Ramser Sr H., L. Producer. TROPICAL STAR (Machiavellian). 7 wins from 1200m to 1700m in U.A.E, Nad al Sheba Mahab Al Shimaal S., Gr.3, Al Shindagha Sprint S., Gr.3, E-Vision S., Al Shindagha Sprint Prep S., 2d Nad al Sheba Dubai Golden Shaheen S., Gr.1, Godolphin Mile S., Gr.2, HH Sheikh Maktoum al Maktoum Challenge S. No.1, Gr.3, Burj Nahaar S., L, 3d Nad al Sheba HH Sheikh Maktoum al Maktoum Challenge S. No.2, Gr.3, Al Shindagha Sprint S., L.
Soft Breeze. 2 wins at 7f, 1m, Ascot The Mail On Sunday Mile Qualifier, 3d Goodwood ABN Amro H., Newbury Courage Best H., York EBF 2YO S., Newmarket Directa Gaffa S. Producer. MOVE IN TIME (Monsieur Bond). 9 wins-1 at 2-to 1200m, £188,232, €306,625, to 2015, Longchamp Prix de l'Abbaye de Longchamp, Gr.1, Prix du Petit Couvert, Gr.3, Ascot Rous S., L, Doncaster Bet365 H., Newmarket Oakmont Construction S., 2d Ascot Cornwallis S., Gr.3, Longchamp Prix du Petit Couvert, Gr.3, Prix de Saint-Georges, Gr.3, Tipperary Abergwaun S., L, Ascot Shergar Cup Dash S., York Symphony Group S., Irish Stallion Farms Sprint S., 3d Goodwood King George S., Gr.2, Curragh Sapphire S., Gr.3, Newmarket Abernant S., Gr.3, Sandown Scurry S., L, Fontainebleau Prix Cor de Chasse, L, Newbury Weatherbys Super Sprint 2YO S., 4th Curragh Flying Five S., Gr.3, Sapphire S., Gr.3, Haydock Achilles S., L, Ayr Harry Rosebery S., L.
KOURNAKOVA (Sadler's Wells). 2 wins-1 at 2-at 1m, 9½f, Gowran Denny Cordell Lavarack Memorial Fillies S., L, 2d Curragh Athasi S., L, 3d Longchamp Prix Marcel Boussac, Gr.1. Producer. Shadoof. 7 wins at 1¼m in GB and Saudi Arabia, Epsom Valliant H., Vodafone H., Newbury Scottish Equitable Jockeys Association H., 2d Epsom Valliant H., 3d Newmarket Cambridgeshire H.
Mesopotamia. Winner at 1¼m, Curragh Virtual Racing on Sky Channel S.
Spizigun. 9 wins from 1800m to 3000m, €109,141, Milan Premio Copreno, Premio Grosotto, Premio Tamaro, Rome Premio Artaius, 2d Rome Premio Associazione Alzheimer, 3d Rome Handicap d'Autunno, Premio Comune di Grottaferrata. Sir Duke. 7 wins from 1¼m to 12¼f, Doncaster Securitas Security Services H., Urban-I Contemporary Living H., 2d Ascot Landsbanki Apprentice H.